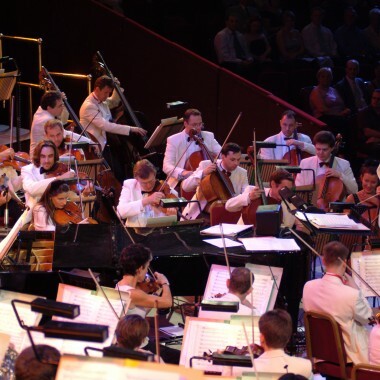 The London Pops is the only major British orchestra to specialise in entertainments of popular music from stage and screen. Since their London debut in 1984, an exciting mix of the capital’s leading musicians have worked together with conductor Ian McMillan to create the distinctive London Pops sound. The London Pops only play scores if the highest quality, to match their attention to detail in the making of varied and well-paced programmes. They create a refreshingly relaxed style of presentation by wearing colourful clothes and using specially designed lighting and stage effects. 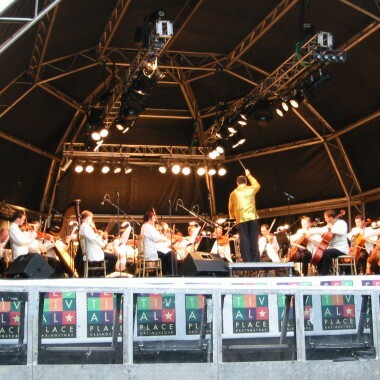 The London Pops actively encourage the audience to join in the fun, with their lively conductor Ian McMillan hosting each gala in a friendly and informal way. The London Pops can also give a thrilling outdoor presentation, with fireworks, lasers and dancing fountains! The Musicians – The orchestra is made up of London’s top musicians in a superb blend of rich strings, colourful wind and brass and, in the showbiz programmes, a dynamic rhythm section. With the emphasis on the younger and bolder player, the London Pops uniquely combines freshness and enthusiasm with fine musicianship and classic orchestral quality. The Conductor – Ian McMillan is a renowned conductor and musical director specialising in music from stage and screen. He is also known as a master of audience participation and brings an extra dimension in hosting each London Pops gala. The Stars – The London Pops can arrange for a famous TV personality to host a gala. Events have been introduced by David Jacobs (BBC Radio 2), Henry Kelly (Classic FM), Barbara Knox (Coronation Street), Gary Wilmot (BBC TV Showstoppers), Tim Vincent (BBC Blue Peter). Subject to their availability, the following guest presenters may also be available to host an evening with the London Pops: Gloria Hunniford, Tony Slattery, Catherine Zeta Jones, Nick Berry, Honor Blackman, Lily Savage, Patricia Routledge, Joanna Lumley, Karl Howman, Gary Linekar, Maureen Lipman, Richard Baker, Dale Winton, Tim Rice, Dame Hilda Bracket, Sue Pollard, Chris Barrie, Gillian Taylforth. 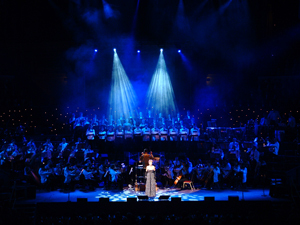 The Singers & Soloists – The London Pops gala entertainments usually feature at least one guest star soloist. These have included Rosie Ashe (Phantom, Oliver), Marilyn Hill Smith (BBC Radio 2, International soprano), Mary Carewe (BBC Radio 2, Starlight Express), Richard Coxon (International tenor), Justin Lavender (International tenor), Stephen Hill (BBC Radio 2, Cats), Mike Dore (BBC Radio 2, Cats), Marti Webb (Evita, Song & Dance), John Ayldon (D’Oyly Carte Opera), Gary Wilmot (BBC TV), Barbara Knox (Coronation Street), David Owen Norris (International concert pianist, radio broadcaster), Iwan Llewelyn-Jones (International concert pianist), Martin Robertson (International saxophonist).